Q: Can we start with an overview of who you are and a bit of the history behind Tactical Hog Eradication? 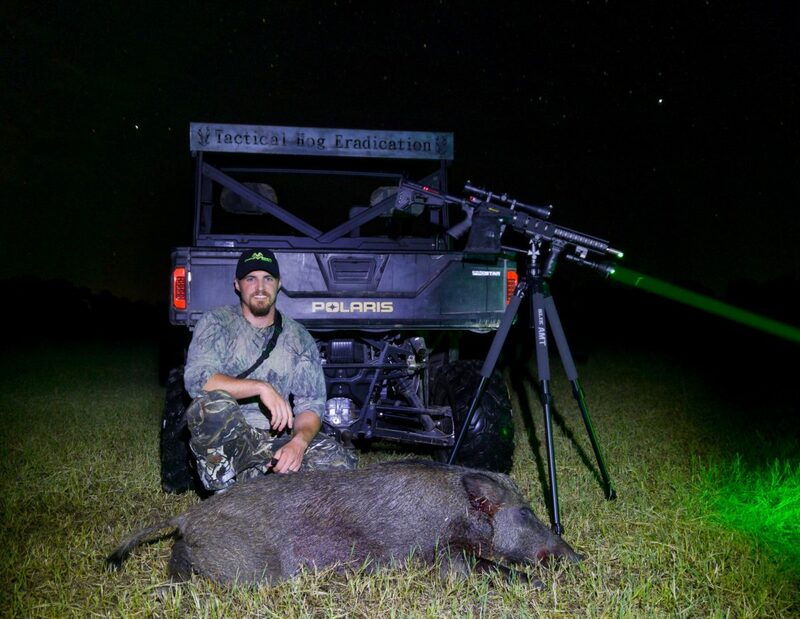 Brad Noblie, Tactical Hog Eradication: My name is Brad Noblie and my son goes by Bradley. Some of his friends call him Brad but we’re known in the hunting community mostly as Brad and Bradley. We’ve been hunting since Bradley was a little kid. The land we hunt is mostly farmland that is family owned. A lot of it was either for wheat or peanuts, and as it turns out, that’s what really ended up starting all of this. 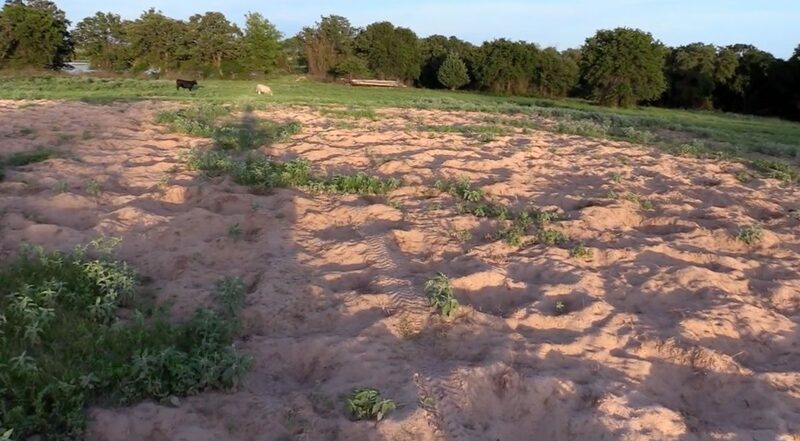 The hogs began invading the peanut crops, and it finally got so bad that it would be just an insurance claim at the end of the year. The farmers just totally quit. Bradley (left) and Brad (right)..screen cap from Elusive Wildlife Technologies video embedded below. So, when this started happening, we decided we needed to start hunting them. So, we started hunting them quite a bit. At first we just used bolt action rifles. We realized pretty quick that we needed something that was going to knock more hogs down as quick as we could with more firepower. That led us to the AR. I had bought my first AR in 1986. After shooting it and seeing the way it was designed and built after tearing it down, I thought it was the greatest thing ever. I loved them from that point on. But back then you didn’t have all the companies making all the aftermarket parts like they do now, with the hand guards, the uppers, lowers, stocks…it’s just endless. You can mix and match however you want. 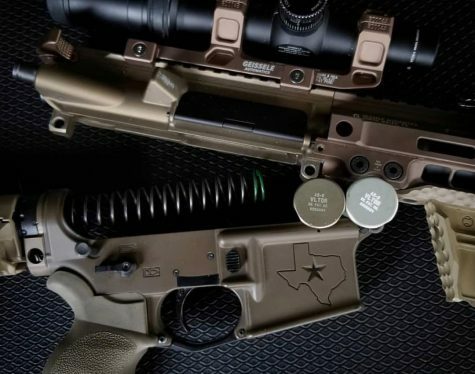 They have good barrels now, good triggers…and if you put on a good barrel and a good trigger on one, you’ve got a heck of a good shooting rifle. Q: So, do you do guided tours or anything, or is this just more of an eradication effort at this point and time? 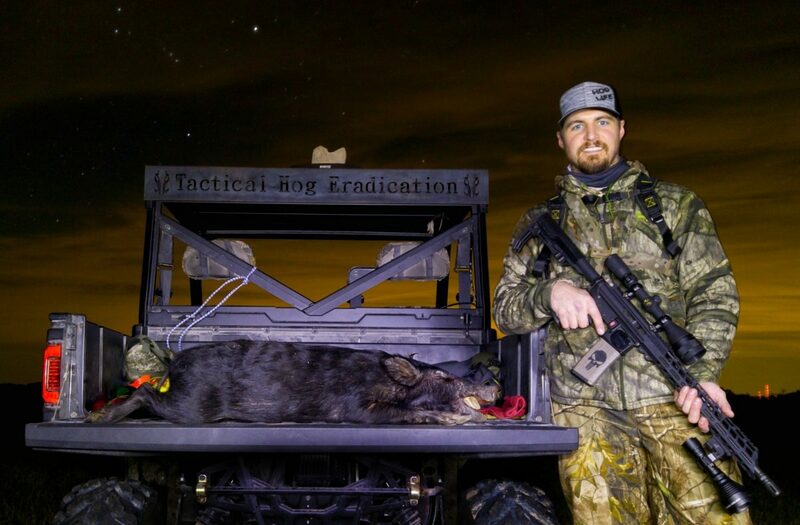 Brad Noblie, Tactical Hog Eradication: It’s mainly just trying to help out the local land owners. A lot of them are family. As far as guided hunts, we don’t do that…but we do take people who want to go, but it’s getting to where we might get into something like that. 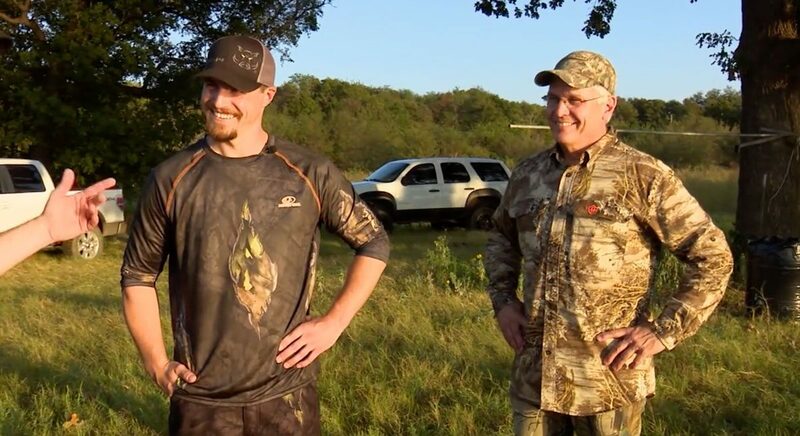 But right now, it’s just a father and son thing where we love to hunt and we want to help the landowners out to prevent the destruction that these hogs leave wherever they go. 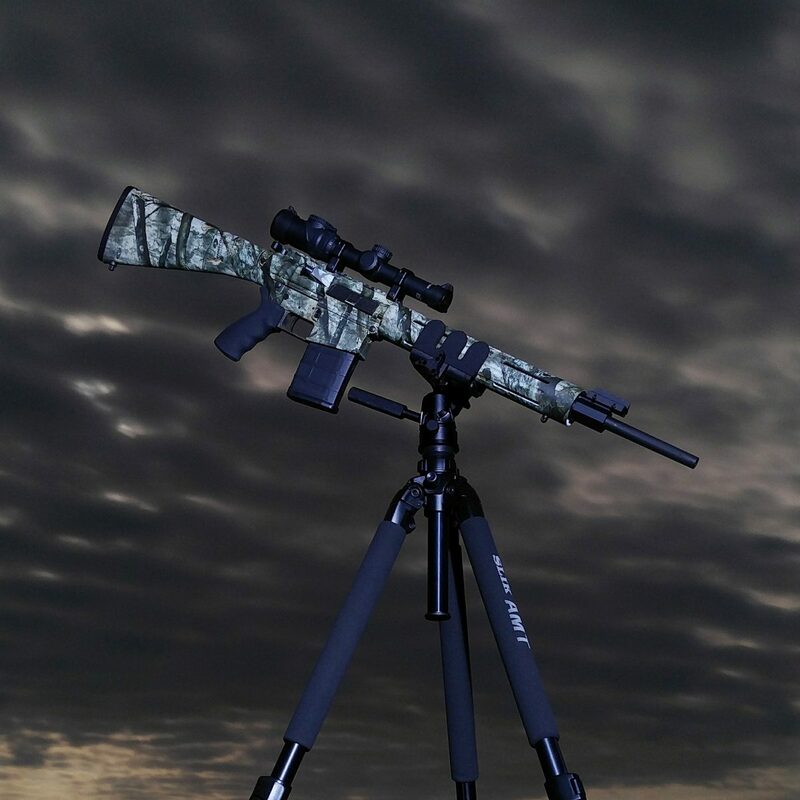 As far as the name, Tactical Hog Eradication, Bradley had originally wanted to call it “The Hunting Specialists”…the “Tactical” part, well, that came when we started using ARs. I had bought my first AR in 1986. And after shooting it and seeing the way it was designed and built after tearing it down. I thought it was the greatest thing ever. I loved them from that point on. Q: Can you describe the hog situation where you’re at? Just how bad is it? 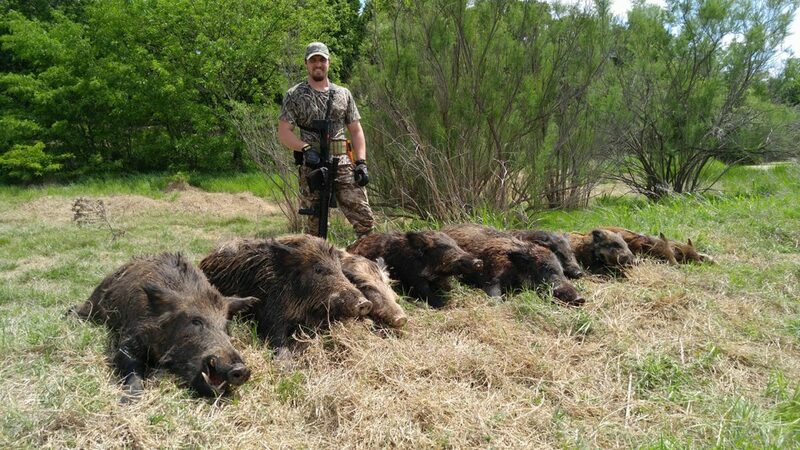 Brad Noblie, Tactical Hog Eradication: The destruction they cause is truly unbelievable. They can go in and in one night, if there is a group of 30 or 40, they can wipe out a farmer’s hard work in just a few hours. 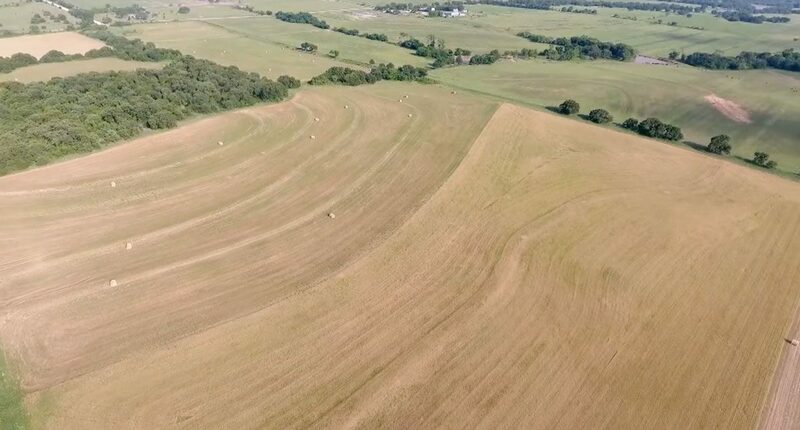 When they plant the wheat, they will go right down the row that same night, their sense of smell is so good, they will go right down the row, just exactly where that grain was planted. They’ll root every bit of it up. If the ground is pretty soft, like a sandy loam, they will dig holes deep enough where it is hard to get a tractor across it to try to smooth it up. As far as the wild hog goes, you have to kill 70 percent of the population just to maintain the population. If you kill seven out of ten hogs, you’re still just keeping the population the same. You’re not really reducing the numbers. And when you put pressure on them, they do tend to get more nocturnal. 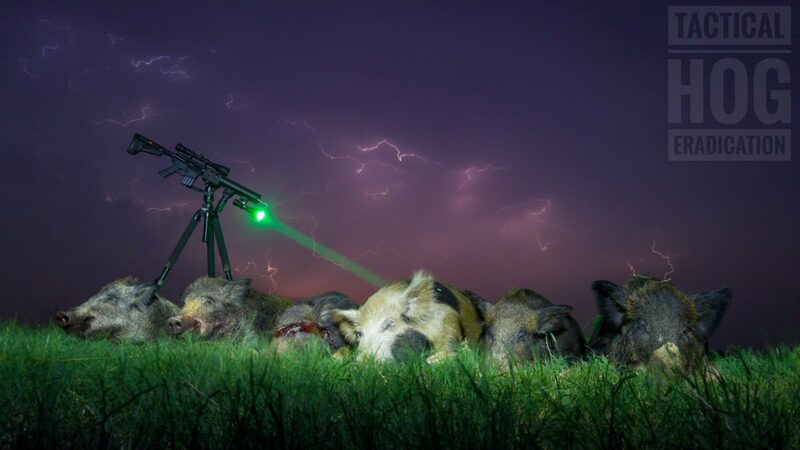 If you hunt a group of hogs that have never had pressure on them, you’ll see them out in the day time, or out in the evenings, but once you put the pressure on them, they become pretty much nocturnal after that. We go way back hunting them with lights, but in about 2016, we starting posting pictures on social media. It was not long after that Elusive Wildlife Technologies picked us up. 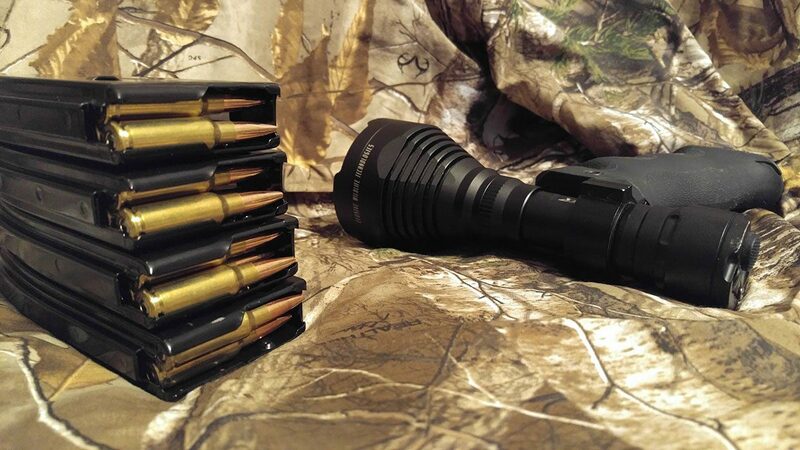 They make weapon mounted light for bows, rifles…they make feeder lights. And we use their lights quite often. We’ve even done a show or two with them. We use their bigger weapon-mounted light, which is the 750HD. We really like the green lens. 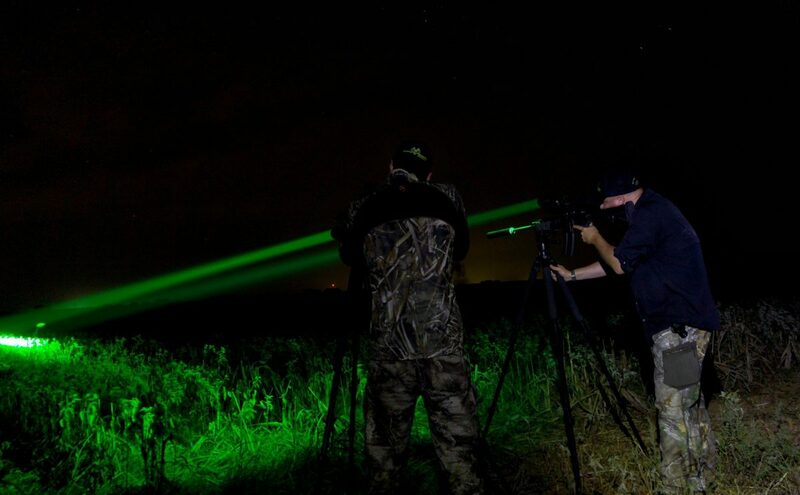 On hogs, because you can’t see their eyes like you do coyotes and other predators, the green light works really well for us. You can see the animal a lot better and it does not seem to spook the predators at all. We have noticed that the hogs eventually get a little skittish if pressured quite a bit with the light at night. So we make sure we are very careful, but we are able to get very close to them with the light. They make a really good product and they’re good people who stand behind their products as well. Q: I want to keep the article focused on hogs as much as possible, but you mentioned coyotes…Can you talk a bit that and perhaps explain why they are a nuisance? 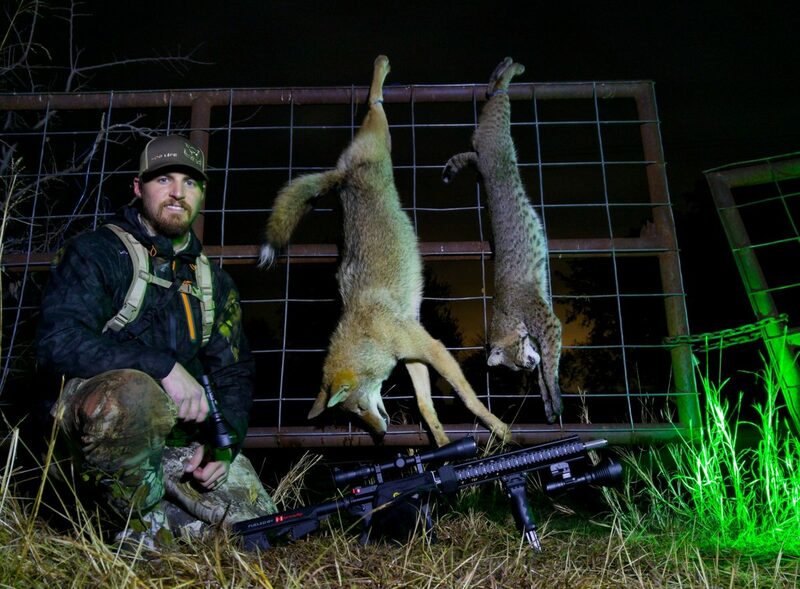 Brad Noblie, Tactical Hog Eradication: Years ago, all I did was predator hunt. I didn’t deer hunt or anything until my son came along…and then we started to deer hunt a little bit. My main thing was predator hunting…and I still love it. Even when we go out to hog hunt, if we see a predator, we call it and we’re going to shoot it. It’s just something that we really enjoy doing…but you are correct in that they are a nuisance also. They are just about everywhere and it can be a problem. They get really over-populated and they are a big threat to the deer herd and farmer’s calves. A lot of the farmers that have cattle…they want us killing those coyotes. So, we don’t turn it down. If we get a chance at it, we’re shooting coyotes. I’ve seen first hand that the coyote is going to take advantage of every opportunity they get to kill something if it means food to them. Again, the problem down here is mainly cattle and the deer herd. Especially when the fawns are about to hit the ground here. They also are devastating to ground nesting birds like quail and turkey too. So, we don’t every really stop hunting coyotes…we hunt all year long, and there is no season on them, same as with the hogs. We hunt both all year long. 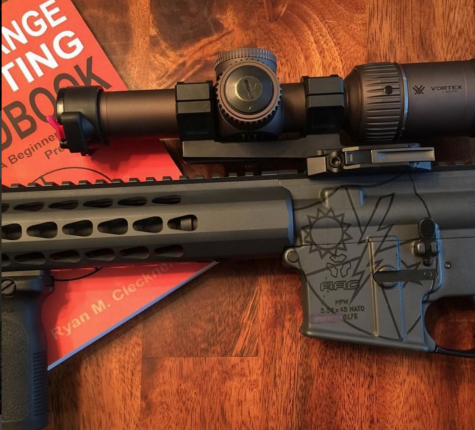 Q: We get a lot of questions from folks wanting to know how to build an inexpensive hunting AR…If someone wants to put together a hog hunting build, what would you advise? 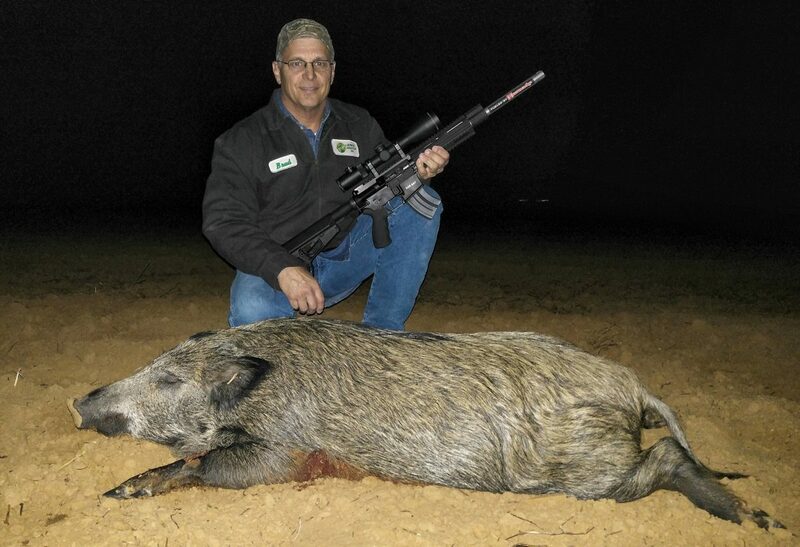 Brad Noblie, Tactical Hog Eradication: With the suppressors, that brings shorter barrels. Where a 16” barrel used to be considered a little short on an AR, now it’s perfect. It’s lightweight. 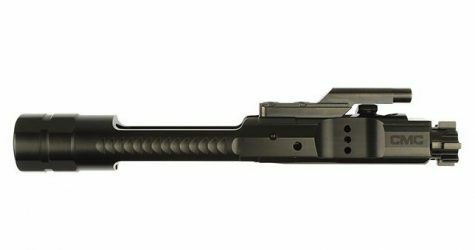 The AR-15 is a smaller platform than the AR-10 and that’s one of the main reasons we use it. 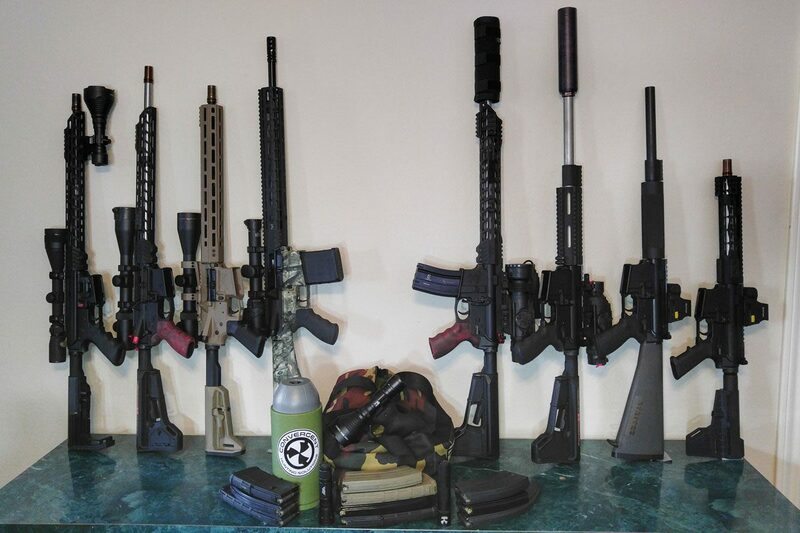 We shoot different calibers, but we stay with the AR-15 platform because we do end up walking a lot. As far as optics, for what we do you don’t need a lot of power. A lot of the good 1-4 or 1-6, up to 3-9 is really all you need. Now, we really do like having an illuminated reticle of some type. There’s no need with that to get too carried away with it. Some of the reticles get too busy and we don’t really like any of that. What we really like is just the dot in the center being illuminated. That allows you to see everything else in the field of view very well. But with hogs at night, because they don’t have eye shine like predators do, that dot really helps out. But as far as the build, I’d just say keep it light. You don’t need to do anything too exotic. Even the barrels now, they make barrels now in a lighter weight that are very accurate. You don’t need those heavy barrels like you did years ago. So, keep it at 16”-18”. That works really good. 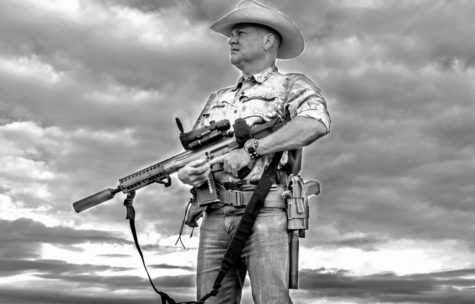 But that’s not say a suppressed SBR or a pistol around 12.5” to 14” wouldn’t work good, depending on the caliber. 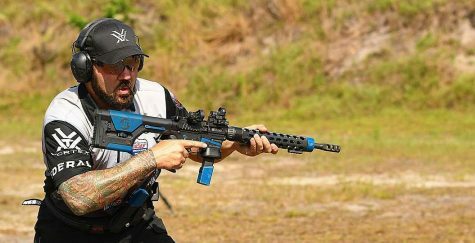 Brad Noblie, Tactical Hog Eradication: Yes, I can tell you my experience but some people might disagree a little bit with what I like. As far as hogs go, and even predators, my main calibers in the AR-15 platform are going to be 6.8, 6.5 Grendel. In the AR-10, you’re looking at .308 and 6.5 Creedmoor. But as far as an AR-10, my favorite, all-around caliber, just one gun, one caliber, everything considered would be a .308. Ammunition is available everywhere…it gets the job done. Even with a fairly poor hit, the .308 is going to bring them down. You do have a little more weight and bulk to deal with but it works…it really, really works good. 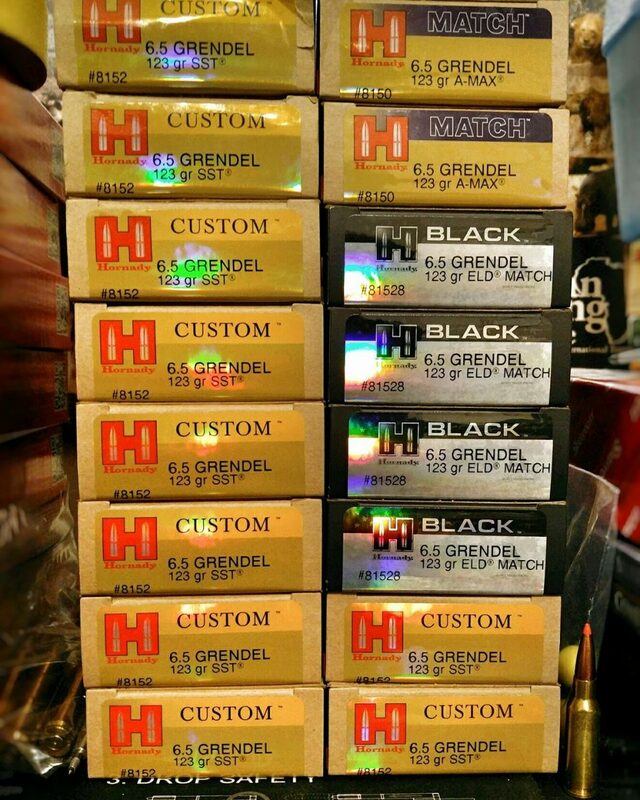 Q: Why do you prefer the 6.5 Grendel over the 6.8 for hog hunting? 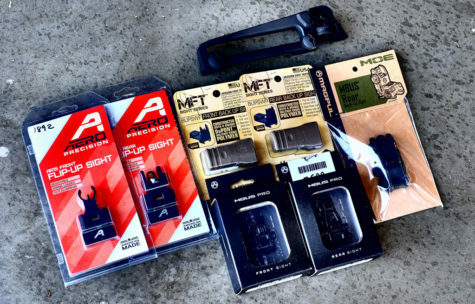 Brad Noblie, Tactical Hog Eradication: We tried the 6.8, but I’m a big reloader. The reason we shoot 6.5 Grendel a lot is because there is a lot better bullet selection for the 6.5 Grendel than there is for the 6.8. If you are shooting factory ammo, then you can’t go wrong shooting either one. 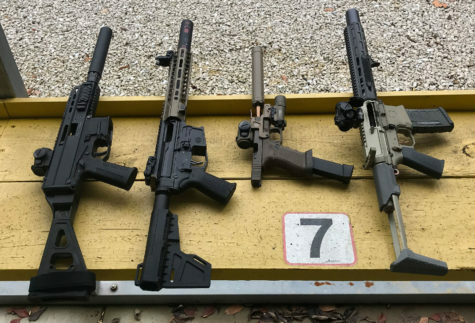 As far as the difference in how they kill, you’ll have some people say “maybe out to 100 yards, the 6.8 will edge out 6.5 Grendel,” but I really don’t believe that. And it’s simply because if you have a choice of what bullet you are going to put in there, then you can put a bullet in there that is going to make the 6.5 Grendel as effective or more effective than what the 6.8 is. That’s just my opinion. Then when you go long range, and in a hunting application you seldom get long range shots, but if you do, you have the superior ballistic coefficient of the the 6.5 bullet. 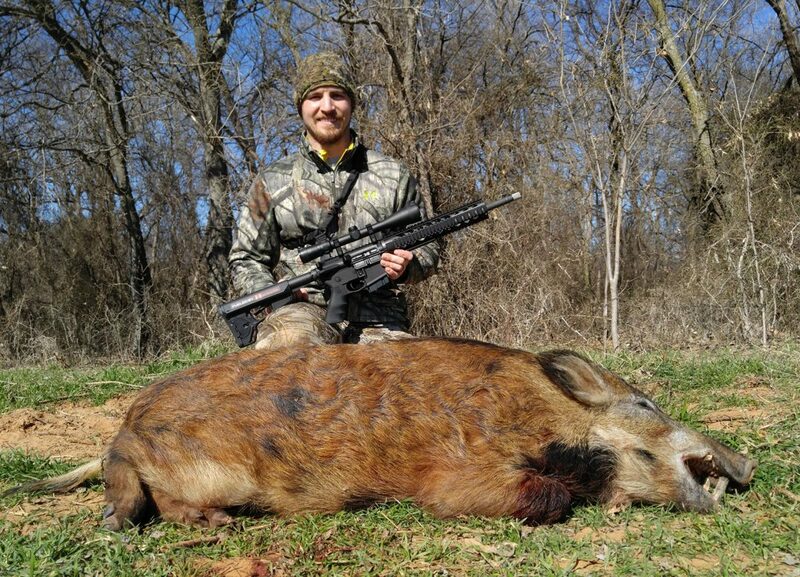 Bradley with a 6.5 Grendel…he dropped this copper-colored hog at a distance of 15 feet. You hear a lot of people talking about having malfunctions with the 6.5 Grendel because of the design. We have had none. That round has been so reliable for us that I would never consider going to something else because of that. 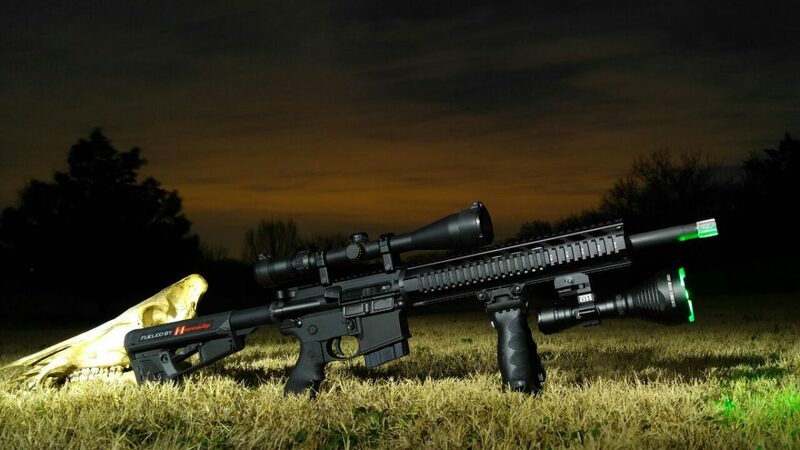 Q: If a new builder wanted to build an inexpensive 6.5 Grendel AR for hog hunting, what should that build look like? 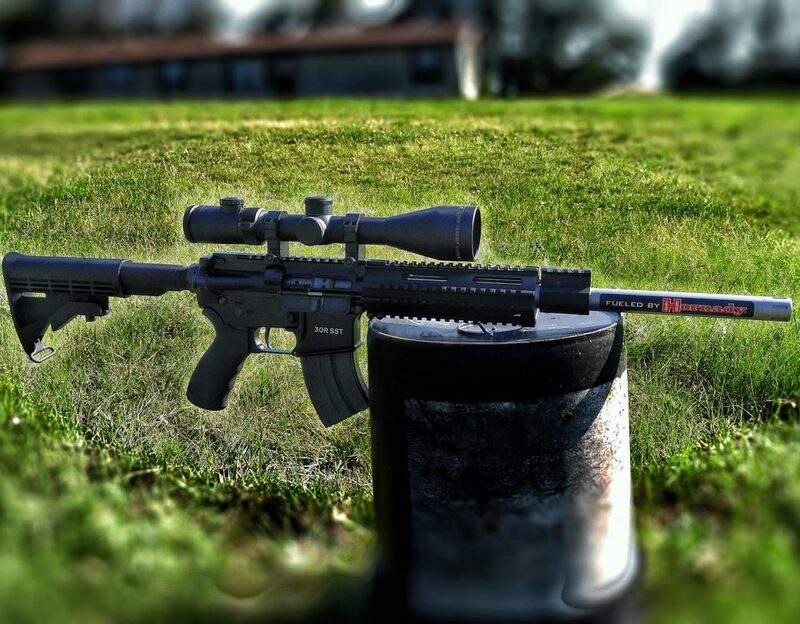 Brad Noblie, Tactical Hog Eradication: I would say something with a 16” barrel works really good for 6.5 Grendel for hog hunting. Especially if you are going to go suppressed. As far as optics, something like a LPVO or a thermal. 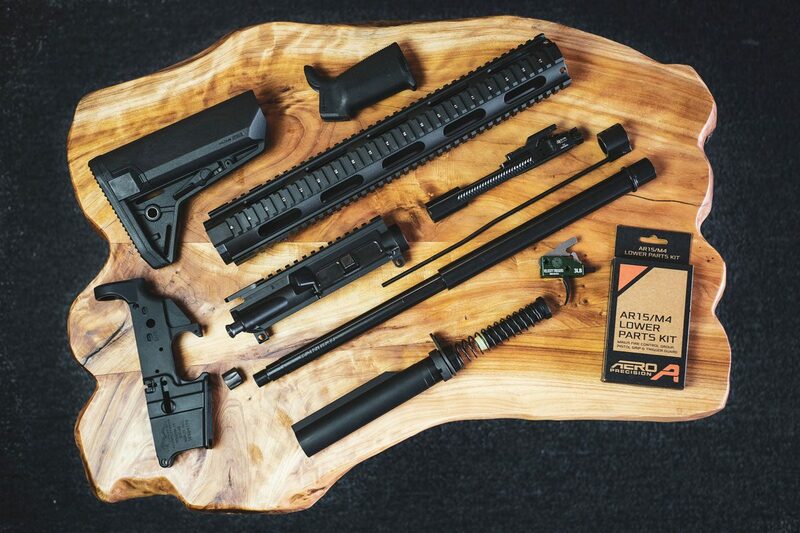 Preferably a collapsible stock, where you can adjust it…and that’s pretty much it for a 6.5 Grendel build. As far as barrel, just use a good barrel. Being that I build my 6.5 Grendel ARs for myself, I know that there are a lot of good barrels out there. We use SATERN barrels but there’s so many good ones out there…and that’s the beauty of it. There’s such a wide choice there. 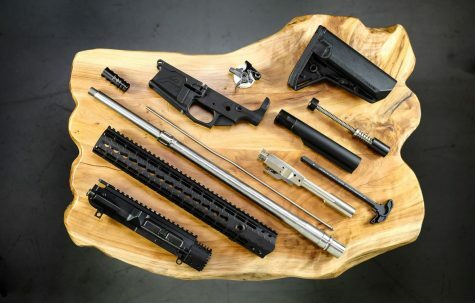 There are some not-so-good ones we try to stay away from, but as long as you stay with a reputable barrel maker, you’re not going to have any problems with the 6.5 Grendel. Q: So, when you’re reloading a 6.5 Grendel, is it the speed that kills, from your experience? 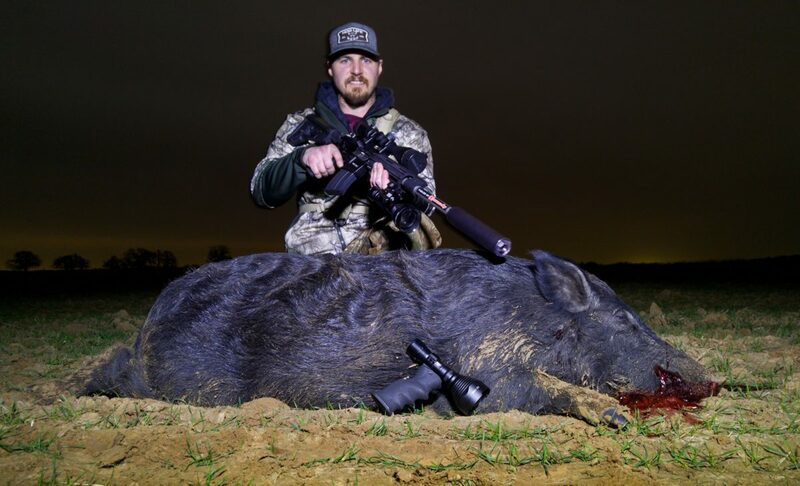 Brad Noblie, Tactical Hog Eradication: ﻿I can tell you this…in the 6.5 Grendel, we have found that for hunting purposes, the lighter bullets like a 100-grain, down to the 90-grain that Speer makes works for us. Even though it’s a varmint bullet, these work well on hogs because of the speed. It probably works better than it should. 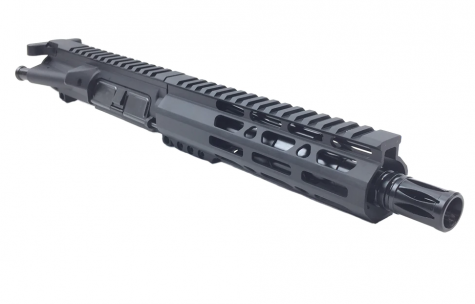 But what we really like is the 105-grain Cavity Back in the 6.5 Grendel. That bullet right there is really hard to beat. 105-grain Cavity Back…for more on this round, be sure to view our feature article on Cavity Back. Now, when you’re talking about the .308, you’ve got a lot more horsepower there, so you can get away with different bullet weights. I would not go down to a 125-grain unless it was more of a bonded type bullet, but 150-168 in a .308…you just can’t go wrong. Those will take care of everything. It’s the sweet spot. 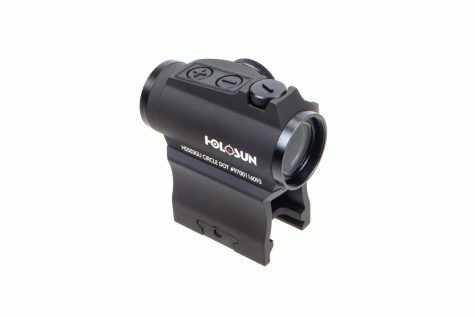 Q: I’ve not heard you mention 300 Blackout….when it comes to specifically hogs, Is .300 Blackout perhaps a bit overrated? 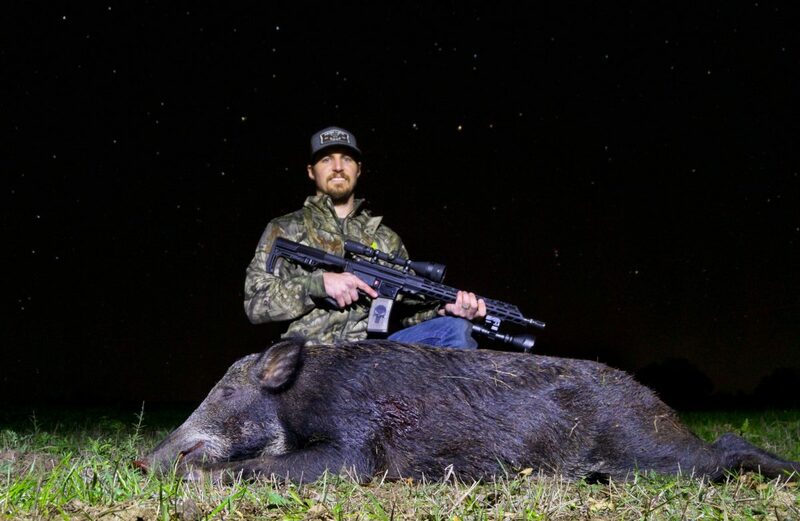 Brad Noblie, Tactical Hog Eradication: I think it is. 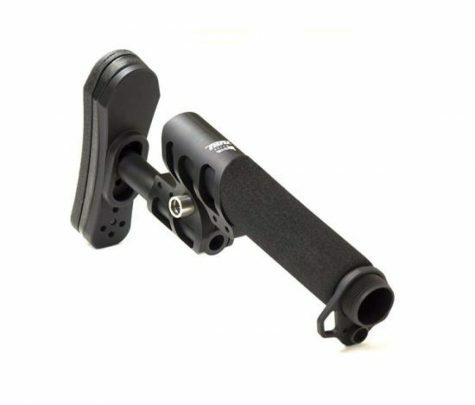 It works as a suppressed round very well. I don’t think it’s cut out for hog hunting. It’s just not enough. 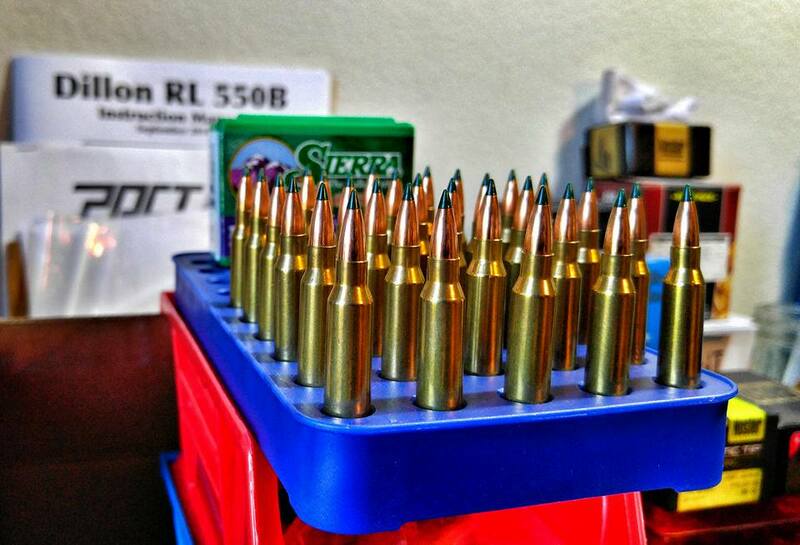 On the other hand, we shoot a lot of 7.62 x 39 out of the AR platform at hogs. I know that case-capacity wise they are very close to the same, but if you put a really good bullet in that 7.62 x 39, it kills very, very well. I’d really rate it just behind the .308. With a Cavity Back bullet in the 7.62 x 39 or even the 123-grain SST, it’s devastating. I think it’s a combination of the velocity it’s going and the design of those two bullets. They work very, very well on hogs. Actually, what we do is we take the steel-cased Russian ammo, and we pull the bullet. I pull that full-metal jacket bullet, and I put in that good bullet in that case. Now you’ve got a very good bullet that’s accurate, and you don’t have to worry about your cases for reloading. You can just let them fly. We’ve got a Polaris Ranger, and sometimes we get into a group of them, and we run them down with that, the 7.62 x 39 is the best…you don’t have to worry about gathering up all your cases, you’re on the run and you just let them go, but you’ve got that good bullet in there. I know some people want to keep it as cheap they can, so they just use the full metal jacket ammo, but it doesn’t kill near as well when you put a good bullet in there. It just makes that round…it’s just unbelievable how much better it kills. It’s still not that expensive…you’re reusing the powder that’s already inside that existing steel case and the accuracy is very good. It’s good enough to not go to a brass case and a different powder. We just put a Collet Bullet Puller in our press, and just run those rounds through there, pull that bullet out, stick that good bullet in there, reseat it and you’re ready to go. 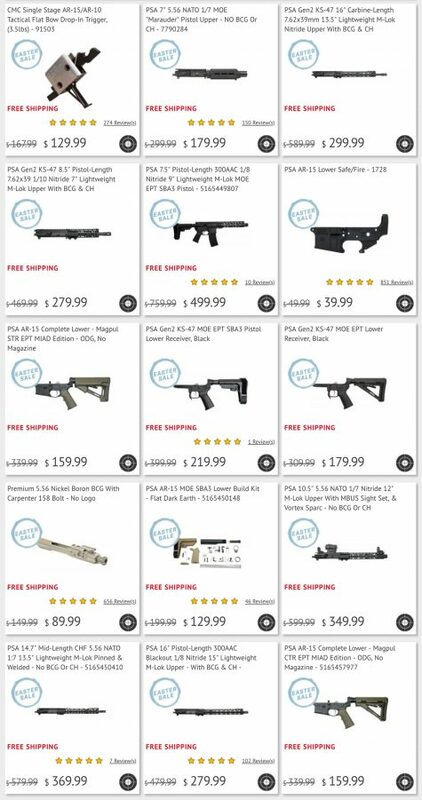 Now if you are just going to use a factory 7.62 x 39 round, then the Tula soft-points would be my choice. I think they make a 154 soft point and a 123 grain. The only thing you may run into with 7.62 x 39 is when you shoot the Russian ammo, it does have deeper seated primers. The cups on the primers are a little harder, so you really have to watch that your firing pin needs to comes through the hole in the bolt a little bit farther than it what it would with other rounds…but I know what that needs to be set at now, so I set all of my guns up that way. And, I think that a lot of manufacturers that are really into 7.62 x 39, I think they are aware of that. People may not like this either, the 6.5 Grendel and the 7.62 x 39, the bolt face is a lot bigger on those two rounds. 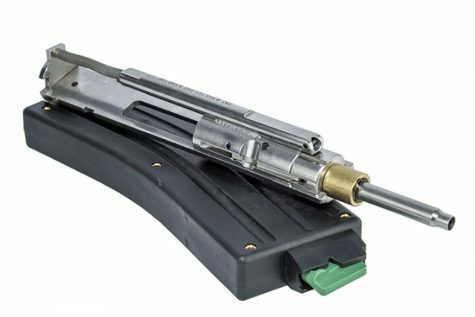 So, you don’t have the thickness at the bottom of the locking lug around that opening like you do in a .223 or something else, so they’ve been known to be a little bit weak and some of them have been prone to breaking, but if you use a JP bolt or we use a Maxim bolt, we have never had a problem. You can run into problems with the trigger itself also. 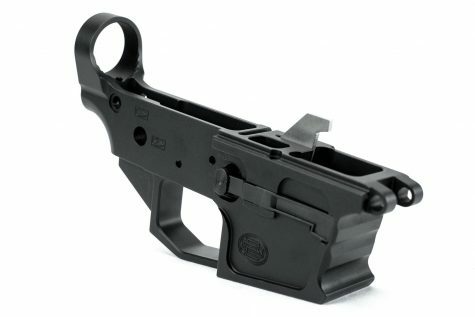 Some of these drop-in triggers you can buy, they don’t have enough mass in the hammer to strike it hard enough, so you have to watch that too. All that said, I have not had any trouble with the 7.62 x 39, and I think if you set them up right, and do the things that need to be done to them, you wont ever have any problems. Q: Finally, I’d be negligent if I didn’t ask about 5.56/.223 for hogs. What’s been your experience there? 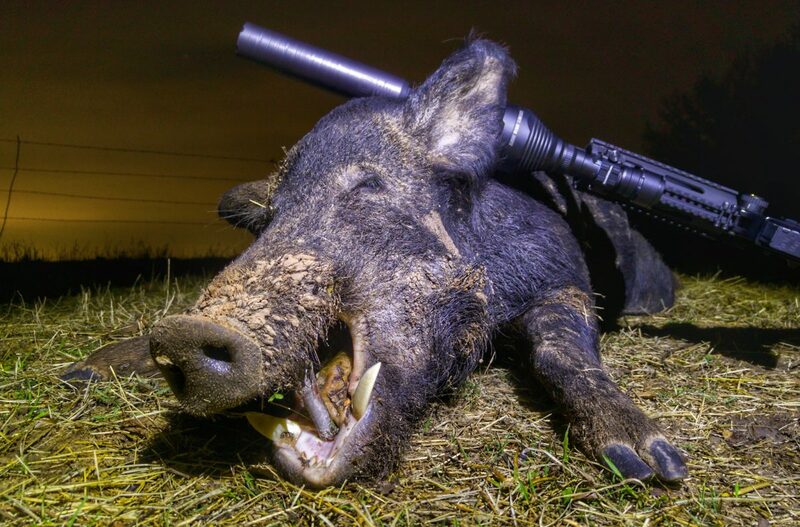 Brad Noblie, Tactical Hog Eradication: We’ve killed a lot of hogs with the .223, mostly my son…but he can tell you it’s no slouch when it comes to killing hogs, especially if you have the right bullet in there. I loaded a 69-grain Sierra TMK in there, which is a target bullet, and it kills so unbelievably well in that .223, we frankly haven’t found anything better. Even like Barnes and some of the bonded bullets…those are very expensive. Whereas, these Sierra bullets are not that expensive, but I believe they kill every bit as good, and the accuracy is just phenomenal.